So before we get any ink into your skin we generally set up an initial consultation. This gives you a chance to make sure we are the studio for you and gives your artist the opportunity to get to know you and understand exactly what it is you are looking for in a tattoo. During your consultation you will be asked a few questions about style you, placement and size. This will help your artist not only understand the design criteria but also establish how long the piece will take to complete. 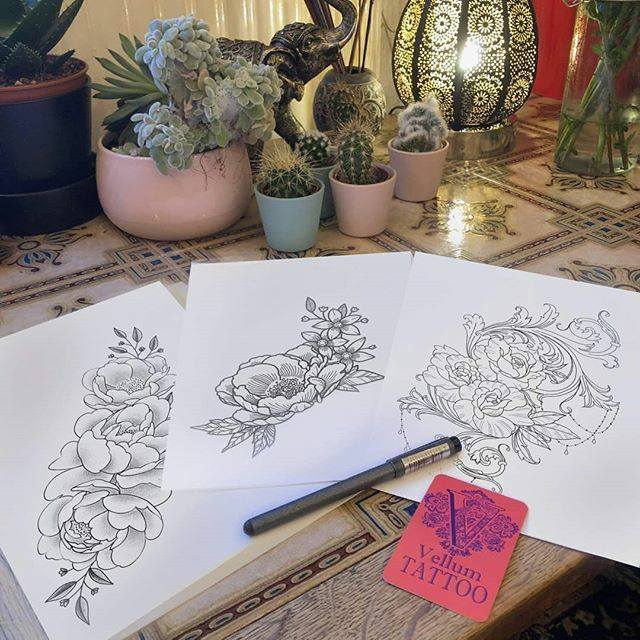 When you visit the studio to discuss your tattoo we encourage you to bring as many references as possible to give your artist a visual aid as to what you want your piece to look like. If it is easier you can always send these images over to the artist before you arrive via email, Facebook Messenger. or direct message us on Instagram @vellumtattoo. ​If visiting us in the studio isn't practical we can organise a phone consultation with your artist although we do encourage you to meet your artist in person to make sure you are comfortable with them and the space. 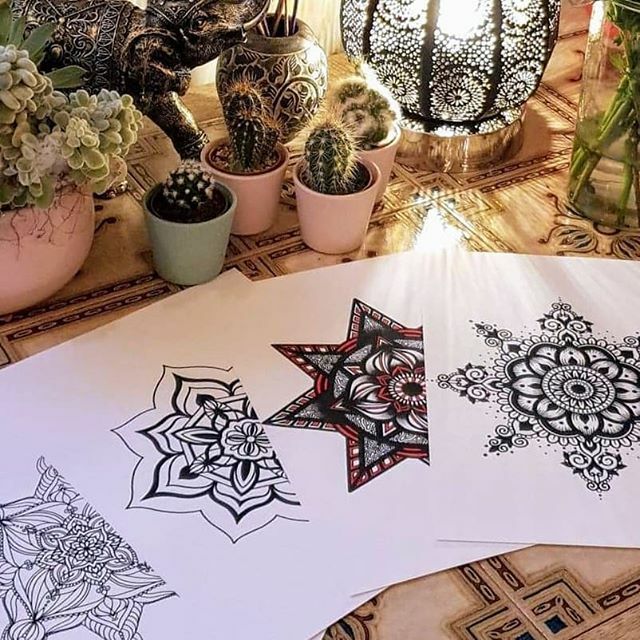 Depending on the type of work that you are wanting your artist may send designs over to you before your appointment to ensure they are working along the right lines. This also gives you the opportunity to ensure everything is as you pictured in your head whilst allowing the artist time to amend anything before your appointment. 2. The Tattoo Appointment - what to expect. Whether it is your first tattoo or just your first one at Vellum here is a quick example of what you can expect. When you first come in you will be greeted with a big hello and a tea or coffee. Your artist will generally be arranging the final preparations as we will not set up any machines until you have arrived for hygiene reasons. Once the paperwork has been completed - don't forget to bring your ID - your artist will start the process of preparing you for the tattoo. This will involve washing and shaving the area to be tattooed and then making sure the design is positioned correctly. Tattoo designs are generally transferred to the skin in two ways, by either using a stencil paper or by drawing them on by hand. The type of tattoo you are getting will determine which of these two processes will be used, though most tattoos are actually a combination of both. If you are getting a cover-up or rework of an old tattoo it is most likely that you will have most or all of your tattoo drawn on by hand. Examples of these two processes are given in the pictures below. Once your tattoo is transferred we are ready to go! You will need to be able to sit (or lie) for an extended period of time so feel free to bring along some headphones and some music or a film to watch if you think that will help you pass the time. If you need to take a break or to go to the toilet just let your artist know, for longer sessions your artist will also need to take a break every hour or so. This tattoo involved a small amount of cover-work and was to be a half sleeve based upon Japanese watercolour prints. The finished tattoo is shown on the right partly healed and partly fresh as it took three sessions to complete. This tattoo also involved a small amount of coverup and is a lower back tattoo. The stencil was used for the majority of the preparation because of the intricate and precise nature of the tattoo. Ensure you have eaten a good meal within an hour of your appointment time. Tattooing can cause a sudden drop in blood sugar levels and so it is always a good idea to make sure your sugars are up and stable. You are welcome to bring snacks and food with you. Wear WARM and CLEAN comfortable clothing that can be removed and allows access to the tattoo area. A zip or button-up cardigan is a good idea especially if you are having your arm tattooed as you can still wear most of it to keep you warm whilst leaving the tattooed arm exposed. Make sure you drink plenty of water the day before and the day of your appointment, this will help the healing process. Being distracted helps! You are welcome to bring along headphones and music or a film to watch - something to keep yourself occupied as being tattooed can be very very boring! Give yourself enough time for your appointment. Feeling rushed tends to add to the anxiety. Make sure you have enough parking, you will need at least 2 hours longer than your predicted tattoo time. Wear white or new clothing - tattooing is messy and we cannot guarantee that your clothing will remain clean and new looking! Do not drink alcohol or take asprin in the 24hours before your tattoo, these thin your blood and will make you bleed more possibly causing loss of ink and slowing down healing rates.